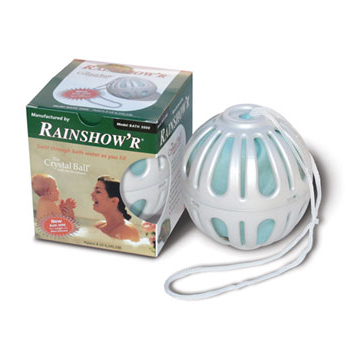 The Rainshow'r Bath Ball is perfect for those who enjoy a leisurely bath and essential to dechlorinate your bath before use. 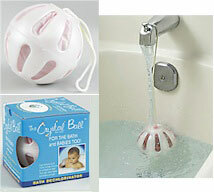 The ball can be swished in the water for 2 minutes or placed under the faucet. The crystal ball for the bath is an entirely new concept in de-chlorinating bath water, requires no plumbing attachment, it works right in the tub, removes 90% or more of total chlorine for a healthier bath. When water comes in contact with the media filament inside the fabric pouch the chlorine ions in the water are converted into a harmless chloride. The toxic effects of chlorine, chloramine, and chlorine gas are eliminated with the aid of a special media. Chlorine is removed quickly when the Crystal Ball is circulated through the water. The crystalline quartz mixed with the media reduces the molecular structure of water into smaller clusters enhancing sudsing and lathering of soap. It is best to place the Ball under running water when you fill up a bathtub. 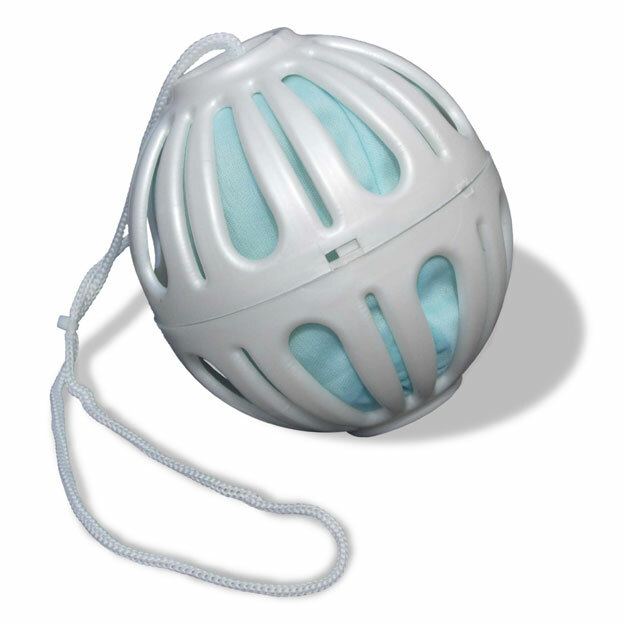 It takes a few minutes for the ball to react with chlorine in water and remove it. You can also swirl or float a ball in water for several minutes in order for dechlorinating effect to take place. Long Lasting, Lasts For Over 200 Baths! 90% or more of your chlorine is removed. The filter media uses extra fine KDF filament. 1.5 oz of filament provides large and very efficient area for rapid water dechlorination in your bathtub, jacuzzi, spa, etc. The Bath Ball also contains 1 oz. of U.S.-mined crystalline Quartz, same as in Rainshow'r shower filter. Crystal has effect of reducing surface tension and increases suds and lather. The unit should be kept clean to maintain long filter life. We suggest replacing the filter pouch after 12 months. Update: This product replaces older BATH-2000 model. The new ball is bigger in size and has slightly more filtering media, but is very similar to the old model. The replacement bags are interchangeable between two models. thank you for following up! Great customer service!